We live in an era of transitions. Transition from the traditional business to the information era, to the current social era. These transitions are happening at a rapid phase. The information era saw a shift from the era of pen and paper to the inclusion of technology within four walls. The social era on the other hand is a shift from the traditional information era to an economy of change. An era of technology no longer defined by four walls. How we do business, learn, lead, connect and communicate reflects this. The entire system has evolved and the biggest testament to this change is the mobile age we currently live in. It’s rare today to find one who does not use a mobile device. These can be in various forms, a Personal Digital Assistant, a Smartphone or a Tablet, to name a few. The usage is such that in 2018 alone, mobile devices alone generated half (52.2%) of all the website traffic worldwide , while a 2017 report states that in 2017 the mobile network accounts for 65.1% of all web traffic in Asia alone . Be it to search for information, do business, for banking, read the news, know the weather, or for whatever the internet has to offer, a mobile device does it all. Our society has gone mobile! Collecting usage analytics to analyse data and receive valuable insights that can lead to smarter investments and increased return on investments. Staying ahead of the competition by marketing your business at the next level to expand your potential customer base. Building a relationship of trust to serve your customers better and attract attention to your brand giving a high return on investments. Whatever your area of business, building a borderless world to establish strong relationship with your customers. Being a fingertip away from your customers so they have a way to reach you anytime they need to. Building In house apps to ensure uninterrupted interaction between employees, irrespective of their locations. 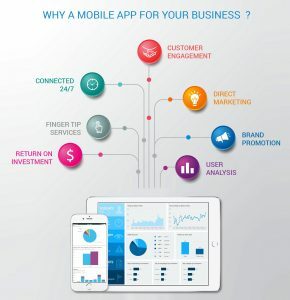 A mobile app for your business is a huge return on investment. To the question, “Is it worth investing in a mobile app?”, the answer is yes. Your business can attract new customers, build a brand image, improve your customer experience, increase sales and revenue, while letting you stay ahead in the competitive market.